Zomato, Domino’s, Indigo & Urban Clap – Who do you serve? On Diwali day, I had written a blog about junk food and as it always happens, we decided to eat Pizzas for lunch the very next day!! We got onto our trusted “Zomato” food ordering app and ordered pizzas from Domino’s. As soon as I completed the payment, I got a pop-up message saying the pizzas will be delivered within 30 minutes. Even before I could read that message in full, the phone rang and a rather curt young lady told me that it will take TWO HOURS for the order to be delivered. I asked her to cancel the order and she said yes and disconnected the call. We waited for a few minutes to see if the Zomato app updated the status of the order, but it just showed that the food was getting prepared. No cancellation had been initiated. 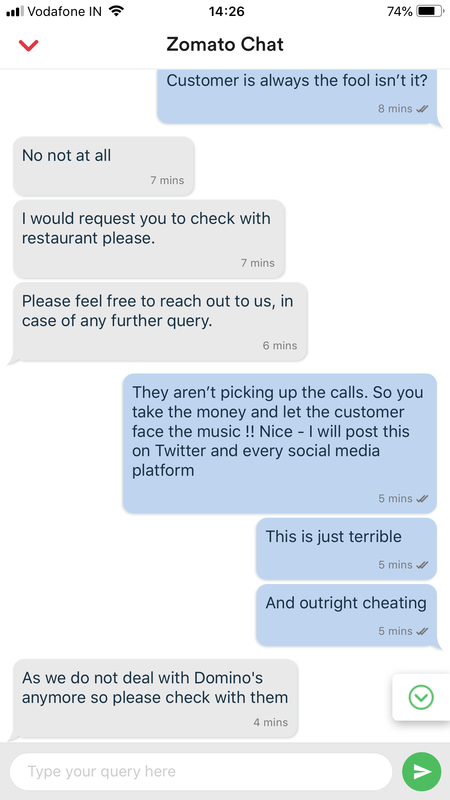 We immediately got onto the Zomato chat and here’s the screenshot of what transpired. It was frustrating to say the least. 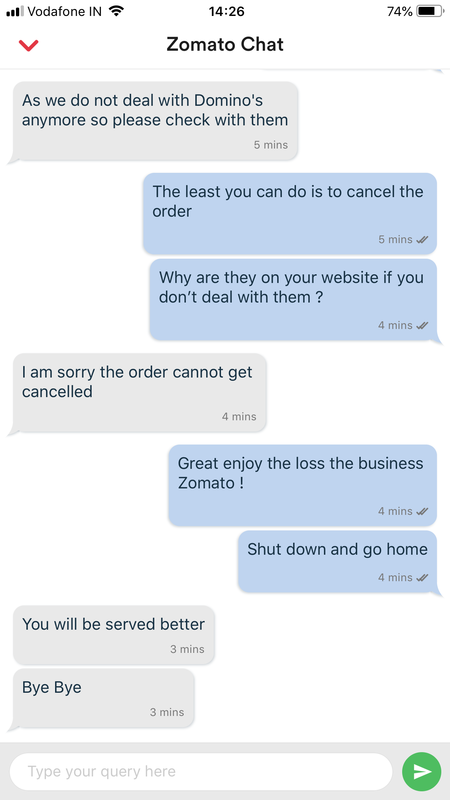 For the first time we realised that Domino’s orders cannot be canceled from the Zomato app. We kept calling the restaurant and were told that the delivery boy had left the restaurant with our pizzas and they weren’t sure when he would reach us. Another young lady told us that we can keep the pizzas for free. She was dismissive and unwilling to even hear me out – I finally told her that they exist to serve the customer, not the other way around …. if there was a manpower shortage as it usually happens right after a major festival, just don’t take orders! Why take the orders and then create this mess? The joke is, the pizzas never got delivered and a refund got initiated much later in the day. I wonder what happened to those pizzas. Its basic common sense that if you take a customer order then be ready to serve, or don’t take the order ! Domino’s maybe doing well today but this kind of mess will lead to a loss of customers and subsequently a loss of business. 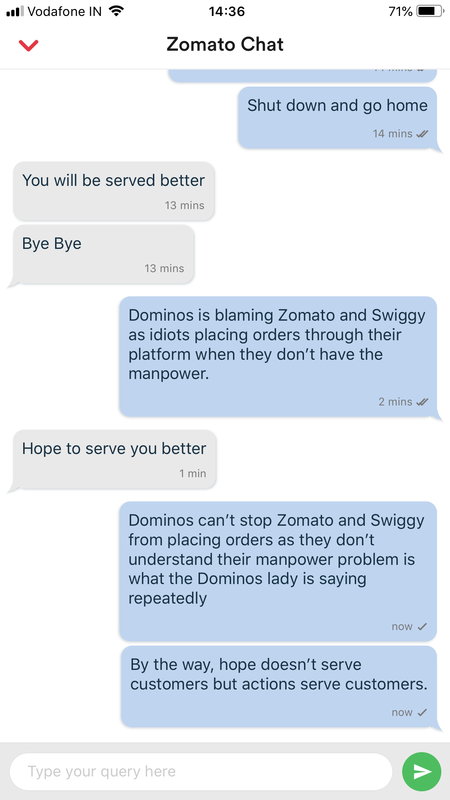 Likewise Zomato will lose business if they don’t inform their customers that Domino’s orders cannot be dealt with by their customer service team. 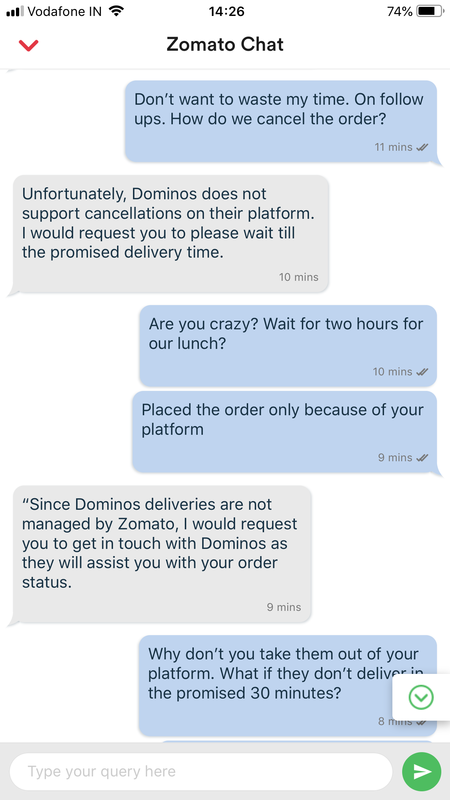 Both Zomato and Domino’s need to ask the question – who do they serve? themselves or the customers ? If the answer is customers, then their processes have to enable that. The third incident happened just a few days back – I booked an appointment on Urban Clap for certain salon services. I paid the money and the screen got stuck on the payment gateway page, but the money was debited from my account. I wasn’t worried, because it has happened before and Urban Clap promptly returns the money. This time though, no therapist got assigned and I got no message from UC. I called their customer service number and explained the issue. The rep who answered my call, told me that he will be refunding my money and that I should book another therapist. I told him this is happening for the fourth time on their app and that they should fix their app rather than wasting my time. He then made the cardinal mistake of speaking to me in that sick “sweet” tone which made me feel like I am an idiot who cannot understand simple “technical” glitches and he has to explain it all to me. I told him off with “I don’t want to know how your system works, I pay you money in return for your service, if you cannot provide the service, don’t waste my time. Cancel the order and fix your app”. Ok, Shalini? I was civil:) My woes didn’t end there – I ordered the service again and decided to pay after the service was completed. I tried paying online and the bloody app wouldn’t give me the pin number so that the therapist could register it on her system and get paid ! I again ended up paying twice before the therapist offered to close the service and let the system figure things out. I told her to call me if she didn’t get the money and she hasn’t called, so am assuming it got fixed. I got the refund due to me as well (I had paid twice). Now, that tone which makes a customer feel like an idiot is an absolute “no-no” … and please don’t try and explain how your app/system works ! The customer is not interested – the app is just a medium to avail of some service that you offer. If its not doing that, fix it, and don’t go around explaining why it isn’t doing what its supposed to. So here’s the deal – One, customer service is not about speaking “sweetly” to your customers when things go wrong. Resolve the problem, don’t explain in detail as to how it might have occurred. Two, design your customer service processes with the customer in mind not what is convenient and/or inexpensive for the organization ! Anyone listening ? Thank God!!! I don’t have the habit ordering any food item online. Even if i get tempted slightly your blog removed it. Thanks Malu.